Narrative: The Spokane City Fire Dept. dispatched firefighting crews and their apparatus to 2321 E. 6th Ave. at 00:02 hrs on Tuesday morning, June 17th, for a reported structure fire at that address. Engine #7, from the near-by Lower South Side Neighborhood fire station, arrived on scene and reported by radio that there was heavy fire blowing out of several windows of the single story wood/frame dwelling and they reported further that they were going to attempt to enter the structure with a pre-connected hose lead and locate the seat of the fire. The fire was quickly up-graded to a working fire which added additional fire apparatus to the incident. As additional resources were arriving on scene they were given assignments that included roof ventilation, search and rescue, a back-up hose lead to protect the crew from Engine #7, who were now inside and fighting the rapidly spreading fire in the structure. A second fire attack lead was ordered to assist in the fire fight, a water supply was established, a Safety Officer was assigned, and exposure protection assignments were made. Additionally a Rapid Intervention Team was assigned in case any fire fighters became lost or injured inside the structure. The fire was knocked down after twenty minutes of aggressively attacking the fire but not before the fire had severely damaged the interior of the structure and destroyed most of the contents inside. The tenants of the home were not present at the time of the fire; where they were was not known. A fire watch was set up to maintain a Fire Dept presence at the scene throughout the night and to watch for any stubborn hot spots. The fire damage to the interior of the structure was extensive, and the decision on the building’s future will have to be decided by the owners. The cause of this fire is being investigated by the Spokane City Fire Dept.’s Special Investigation Unit. In all, five engines, two senior ladders, one heavy rescue truck, and two Command Vehicles were used at this very hot fire and 28 fire fighters worked to successfully mitigate the incident. 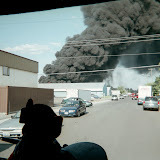 Cause: Under investigation by the Spokane City Fire Dept. 's Special Investigation Unit. Damage: Extensive fire damage to the interior of the building. Most of the contents inside the structure were destroyed.